So you don't want those wimpy softer flexing ski boots, that most of us are skiing today?! Well the '18 Full Tilt First Chair is designed and built for you. 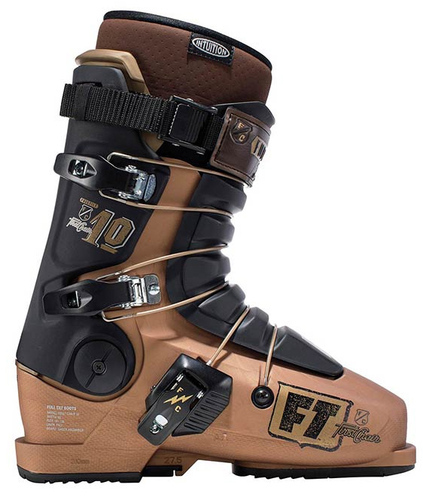 The First Chair comes stock with FT's stiffest #10 Flex tongue and a rigid boot board for instant transfer of your energy to the ski, but they're 2-3 pounds lighter than your old race boots. Rounding out the features of this bomb proof machine are super durable aluminum ratchet buckles and our favorite Quick Fit Pro Liner with custom moldable Intuition foam. Made for relentless hard charging, the 2019 Full Til First Chair needs to be respected and is not for the faint of heart.